Ouch! Quit pulling my beard. Michael Jasper (mijasper) is no stranger to TBB. His creative uses of odd-ball parts are always elegant examples of what can be done with LEGO. 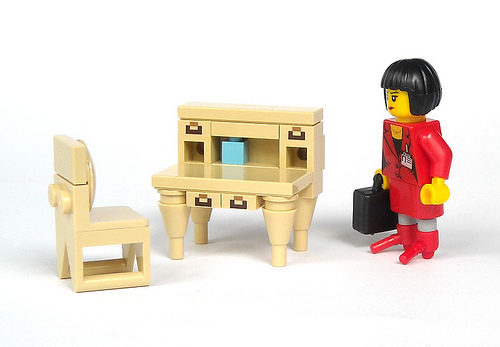 His latest desk makes brilliant use of the printed 1×1 plates from the Minecraft set as well as the new ice cream cone from Friends…not to mention the lipstick usage! Took me a bit to find the lipstick. I don’t care for the heels. Interesting idea though. But that desk is absolutely brilliant. The chair as well. Is that little brick Modulex?